There are 67 Assisted Living Facilities in the West Allis area, with 5 in West Allis and 62 nearby. The average cost of assisted living in West Allis is $3,068 per month. This is lower than the national median of $3,346. To help you with your search, browse the 229 reviews below for assisted living facilities in West Allis. On average, consumers rate assisted living in West Allis 4.2 out of 5 stars. Better rated regions include Wauwatosa with an average rating of 4.3 out of 5 stars. Caring.com has helped 6 families in West Allis find high-quality senior care. To speak with one of our Family Advisors about assisted living options and costs in West Allis, call (855) 863-8283. West Allis, Wisconsin is a southwestern suburb of Milwaukee with a senior population of 14.5 percent. The area was named the second safest metro region by Forbes Magazine, making West Allis a suitable city for seniors who rely on public transportation. With 60 different assisted living facilities within the West Allis area, seniors have plenty of different communities to pick from. Assisted living facilities (ALF) in West Allis, as in Wisconsin, are recognized as facilities that supervise individuals with some level of need who choose to live without 24-hour nursing care. Each facility is licensed and regulated by the Wisconsin Department of Health Services. Within West Allis, the Milwaukee County Transit System provides mass transportation. Seniors and disabled persons are eligible for unlimited rides on MCTS buses for just $1 a day. The West Allis area is home to world-class medical facilities, including Aurora West Allis Medical Center, in the event of medical emergencies or illness. West Allis is considered more dangerous than 91 percent of U.S. cities. Even more significantly, based on the number of murders reported by the FBI and the number of residents in the city, West Allis experiences one of the higher murder rates in the nation. Seniors should be aware that living in West Allis could equate to more unsafe situations. West Allis has an array of community resources for seniors, including the West Allis Senior Center, an organization that offers classes such as acrylic painting and folk dancing and various wellness programs. The climate in West Allis is similar to the rest of Wisconsin - dry and cold. West Allis has temperatures ranging from the 70s in the summer to teens in the winter, as well as an average of nearly 17 fewer sunny days than the national average. Seniors who dislike the cold should consider an area outside of West Allis. As a suburb of Milwaukee, West Allis is in close proximity to various attractions such as the Milwaukee Art Museum and Milwaukee Zoo. Both offer discounted passes to seniors. Assisted Living costs in West Allis start around $3,068 per month on average, while the nationwide average cost of assisted living is $4,000 per month, according to the latest figures from Genworth’s Cost of Care Survey. It’s important to note that assisted living rates in West Allis and the surrounding suburbs can vary widely based on factors such as location, the level of care needed, apartment size and the types of amenities offered at each community. 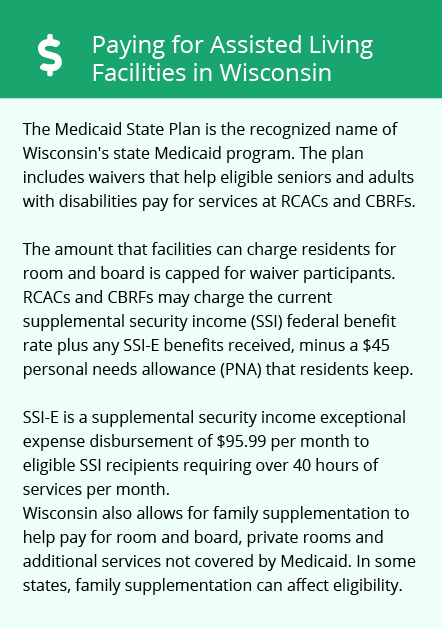 There are two routes for financial assistance for assisted living in West Allis: Medicaid's Medical Assistance Personal Care program and Wisconsin's Exceptional Expense Supplement for Members of Supplemental Security Income (SSI) program. The former is available to seniors residing in an ALF with less than 20 residents, and the latter allows additional Social Security income to be granted to eligible seniors to pay for assisted living. West Allis and the surrounding area are home to numerous government agencies and non-profit organizations offering help for seniors searching for or currently residing in an assisted living community. These organizations can also provide assistance in a number of other eldercare services such as geriatric care management, elder law advice, estate planning, finding home care and health and wellness programs. To see a list of free assisted living resources in West Allis, please visit our Assisted Living in Wisconsin page. 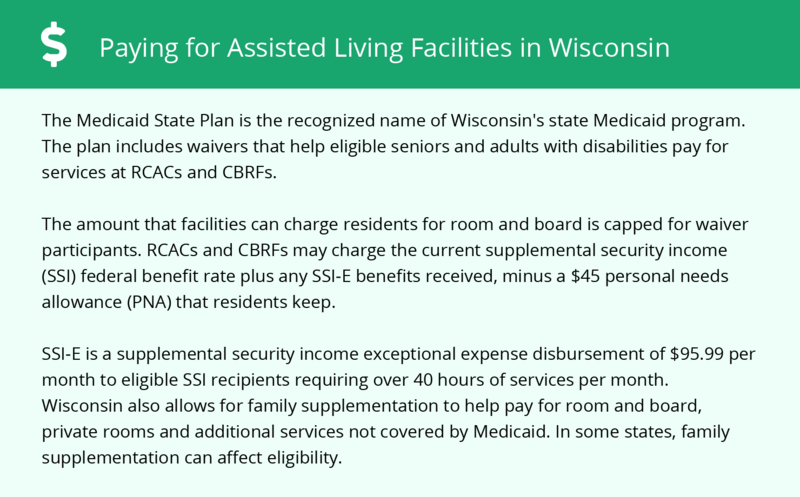 West Allis-area assisted living communities must adhere to the comprehensive set of state laws and regulations that all assisted living communities in Wisconsin are required to follow. Visit our Assisted Living in Wisconsin page for more information about these laws.